Offering free unlimited Wi-Fi and free on-site parking, Amity Motel & Apartments offers spacious, self-contained 1 and 2-bedroom apartments, just 5 minutes’ walk from Queenstown’s centre. 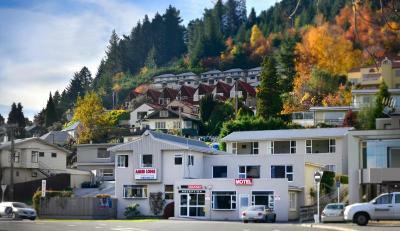 33 Lomond Lodge Motel & Apartments is located in the centre of Queenstown. It offers affordable accommodation, 50-metres from the lake front and gondola. Free Wi-Fi and free parking is available. Located in the heart of Queenstown's city centre, Amber Lodge offers spacious motel rooms and self-contained apartments. Most accommodation offer lake or mountain views. Guests enjoy 1GB of free Wi-Fi per stay. Situated 700 metres from Queenstown centre, this motel offers studios with free WiFi. Some studios feature panoramic views of Lake Wakatipu. The Four Seasons Motel is located in the centre of Queenstown, just a 3-minute walk from shops and restaurants. The rooms are equipped with free WiFi and a flat-screen satellite TV offering 50+ channels. Bella Vista Motel is within walking distance to the Queenstown city centre, the Skyline Gondala and Lake Wakatipu. It offers rooms with beautiful mountain views. Guests enjoy 5GB of free WiFi per day. Just 250 metres from Lake Wakatipu, Alexis Motel & Apartments features a large shared patio offering views of Lake Wakatipu and the Remarkables Mountains. All accommodation offers a kitchenette or kitchen. Abba Court Motel offers affordable and friendly self-contained accommodation with free onsite parking. It is just 900 metres from the Skyline Gondolas and a 2-minute walk from supermarkets. Guests enjoy 5GB of free WiFi per day. Lakeside Motel is located across St Omers Park, a 3-minute walk from Central Queenstown. It offers self-contained lakefront accommodation with a full kitchen. Free on-site parking is provided.